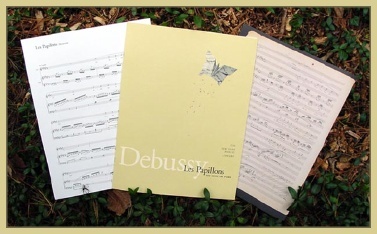 “Les Papillons” for Voice and Piano. First Edition. Text by Théophile Gautier. A Performing Edition and Facsimile of the Composer’s Autograph in the Music Division of The New York Public Library for the Performing Arts, Dorothy and Lewis B. Cullman Center. [JOB 96-17]. New York Public Library, 2004. 27 x 35 cm, 26 pp. Designed by Marc Blaustein. Transcription engraved by George Boziwick. Four-color facsimile of the autograph in the original format. Portfolio, with insert for facsimile and performing edition. Limited edition of 1,000 copies printed on Neenah Classic Laid. the reputation of this early song by a master composer.